← Photo of the Month: Street Culture. And a Little Announcement. One of the most popular recipes in Veggiestan is for KUSHARI – and now a chain of kushari joints is opening across the capital. I thought it worth sharing this interview with one of the chain’s founders: the article was first published in February over on Londonist. Our friend Anissa Helou is one of the UK’s most highly respected authorities on Middle Eastern Food. Hey: if I get really stuck Anissa is the oracle I most frequently consult. The former antiques dealer is the author of six cookbooks (with another out this Summer), and finds time occasionally to give cooking classes in Shoreditch along with (oh-my-God-we-so-want-to-go-on-one-of-these) culinary tours of Turkey and the Levant. And she is helping a group of Egyptian entrepreneurs open a chain of koshari cafes: the first Koshari Street has just opened in St Martins Lane. She is also the owner of the most fabulous big hair. We asked her about the Middle East in London, London in the Middle East, and street food, which is already one of this year’s hot food trends. 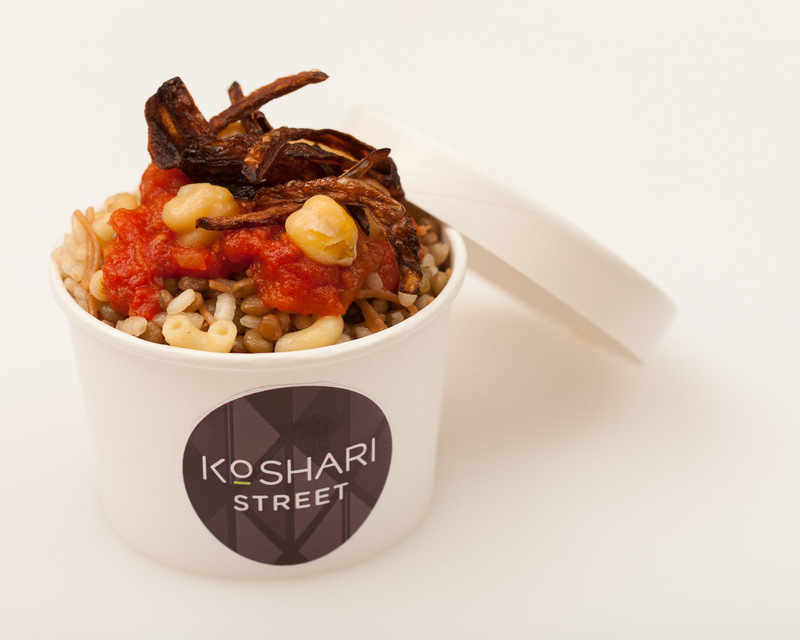 Koshari: nice word, but what is it – and do you think it will give the falafel a run for its money? Well, it is a very different kind of street food. Falafel is a sandwich whereas koshari is a warming dish of rice, pasta and lentils topped with a spicy tomato sauce, chickpeas and caramelised onions. I have added a special touch by serving it with doqqa (a mix of dried herbs, spices and nuts) to add a little crunch. And it will definitely give falafel a run for its money. Why do you think the interest in street food has surged in London? It’s a fun way to eat. It’s not expensive and now that the councils have relented and are allowing more people to have pitches on the street, people can get a great lunch or supper from a street stall selling proper food rather than grabbing a sandwich! Just curious: what made you swap antiques for a career in food? Chance really. I wanted to write a book about collecting, then while listening to a conversation between my agent and a Lebanese friend about cookbooks, I thought I could write one on Lebanese cuisine. There weren’t any really user-friendly books on the subject, and certainly not ones that someone unfamiliar with the cuisine could cook from easily. As luck would have it, my agent knew a publisher looking to do one and the rest is history. This said, I always loved food and often cooked for my friends but one thing I didn’t realise then was what hard work it was to write about food! Could you summarise the salient points of Middle Eastern cuisine in just one or two sentences? In the wake of the horse meat scandal do you think we can learn from Middle Eastern food buying and cooking practices? I don’t think you can talk of a Middle Eastern cuisine. There are many shared dishes throughout the region but each country has its own way of preparing them. This said, you have common threads such as seasonality and well-sourced ingredients, which are essential to Middle Eastern cooks. Also, apart from when people are grilling, or in dishes like kibbe, meat almost always plays second fiddle to vegetables. And no Middle Eastern cook would dream of buying ready-minced meat. Instead he or she would ask the butcher for the cut of their choice to be minced there and then. I doubt we could have a horse meat scandal in the Middle East but I may be wrong. The Middle East is enjoying great popularity in London at the moment – but what do you think the perception of London is in the Middle East? People love London. Great city with amazing shopping, restaurants, activities for children, theatres, cinemas, opera, concert halls. Anything you want really. And many don’t seem to mind the weather. In fact, my friends from the Gulf love the cool rainy weather, while we dream of sunshine! You travel a lot, but have chosen to make Shoreditch your home. What is it about the area that keeps you coming back? My loft and my kitchen! I love my space and I like the atmosphere of Shoreditch, admittedly more during the day than at night. I also love the architecture but unfortunately developers are starting to change the character of the area. What’s in your Little Black Book of London – your favourite shops and restaurants? I love la Fromagerie and Pimlico’s farmers market. I have great restaurants near me (St John’s, Brawn, Rochelle Canteen, Dishoom, Story Pizza and I am sure I have forgotten a few) as well as the best sandwich in London (at Keu). And I love Margaret Howell’s clothes and how the special attention she pays to who sews her clothes and where she gets her fabrics. As a chef, what is your top kitchen tip? Be neat and well organised, and source your ingredients carefully. This entry was posted in Postcards from Veggiestan and tagged Anissa Helou, Koshari Street, kushari, Londonist, street food. Bookmark the permalink.